Twin pedestal. Twin water (mixed) feed. Lever control tap. Standard rose head gun. 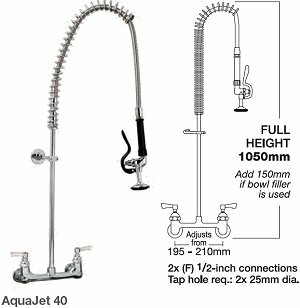 Size Height 1050mm (Add 150mm if bowl filler is used). Aquajet Spare Parts - No 1 on Parts Diagram. Aquajet Spare Parts - No 2 on Parts Diagram. Aquajet Spare Parts - No 3 on Parts Diagram. Aquajet Spare Parts - No 4 on Parts Diagram. Aquajet Spare Parts - No 5 on Parts Diagram. Aquajet Spare Parts - No 6 on Parts Diagram. Aquajet Spare Parts - No 7 on Parts Diagram. Aquajet Spare Parts - No 7a on Parts Diagram. Aquajet Spare Parts - No 8 on Parts Diagram. Aquajet Spare Parts - No 9 on Parts Diagram. Aquajet Spare Parts - No 9a on Parts Diagram.